michelle dunn marsh, image by Sylvia Plachy. Michelle Dunn Marsh is the founder of Minor Matters Books (www.minormattersbooks.com), and Executive Director at Photographic Center Northwest (www.pcnw.org). Over the last twenty years she has connected audiences with practitioners of contemporary art, particularly photography, through publications and public programming. She studied literature and art history at Bard College, and completed an MS in Publishing from Pace University. She has lectured at Parsons/The New School, Yale University, The University of Washington, and at various regional and national photography events. The exhibition All Power: Visual Legacies of the Black Panther Party, curated by Ms. Marsh, was featured at The 2018 Photography Show (AIPAD) in New York. We spoke on April 6, 2018 in the exhibition space. Paula: You curated a show called All Power: Visual Legacies of the Black Panther Party. Why? Michelle: It started with a book two years ago that stemmed out of the experience of being in Oakland, California in 2006. When I was working with Aperture I was involved with the promotion of a book that year timed with the 40th anniversary of the Black Panther Party. Photographer Stephen Shames has a major archive of his work with the Panthers. That was my first real introduction to anything beyond what the average American would associate with the Party—leather jackets and berets and people standing in formation with guns. Paula: That's kind of what I knew of the Black Panthers too. Seeing this show I see a much more complex organization, a more complex set of objectives. What did you learn about the Black Panthers? Michelle: That weekend in Oakland I was meeting social workers, politicians, teachers--a broad range of people who were very invested in community development. I realized that there was much, much, much more to this organization and its history than I knew anything about. So a couple of years later, that same exhibition of Stephen Shames' work came to Seattle. I organized a panel for the exhibition with [family friend and King County Councilmember] Larry Gossett, and Aaron Dixon, Captain of the Seattle chapter. I learned about a free medical clinic that is still in operation in Seattle, some after-school programs, free breakfast programs, many other elements that were part of the social movement of the Black Panthers. I’ve stayed in touch with the legacy of the Party since then, so I knew that 2016 would be the 50th anniversary. It occurred to me that the majority of the photographic material that I had seen, from Pirkle Jones and Ruth-Marion Baruch to Stephen Shames, was primarily from Caucasian photographers. I had one book by Howard Bingham who was Muhammad Ali's primary photographer and he spent some time photographing the Panthers, but I hadn't seen a great deal else. Sometimes you have to just look a little bit deeper. You have to ask some questions. It was important to me not to assume that black artists, or black photographers, cared about the Black Panther Party; there were a lot of social movements and black nationalist movements, and there was also a lot of controversy around this group. I didn't want to make assumptions. So I posed a question to artists that I knew and had worked with. It was not an open call out to everybody, it was a question posed to a group of people that I trusted and whose feedback I respected to say, "Is this a subject that you feel your work resonates with? Do you think that this is something that might be interesting to pursue?" Carrie Mae Weems called me first and said, "Yes, you must do this." She told me that Rene de Guzman, the curator of the Oakland Museum in California, was planning a show. I thought that if Rene did a show and a catalog, I wouldn’t need to do this book because my interest would be addressed. Rene said, "Well I'm doing the show, but I don't have the time to do a catalog. You should do the book that you are proposing and it can serve as a complement to our exhibition." So that is what ended up happening. I contacted 30 artists to start. Sixteen of them responded and submitted work. That was another kind of unusual curatorial decision, or editorial decision in this case. In order for this to be authentic I asked the artists to tell me where they see connections with the theme, rather than me saying I see this connection in an artist’s work. That also meant that I got in a disparate body of work. Typically when I'm developing a book, I've made a visual selection. In this case, I had all of this submitted material, and I to figure out the relationships. I turned to the Ten-Point Platform. I knew that I wanted to include it in the book, but in re-reading it and seeing how timely the language still is today, it became very important as a guiding principle. How do I show the relationships both to an audience that understands the complexities of this legacy and things that are not in the mainstream, as well as provide a context for people for whom this is going to be quite unfamiliar, without pandering to either side? At that point I called Negarra Kudumu, who is a very bright scholar and develops public programs, and asked her to co-edit with me. I wanted her viewpoint to be present, and for her to check me in case I wasn’t maintaining my own line of integrity and authenticity. Paula: Say something about the Ten-Point Platform. Michelle: The Ten-Point Platform was the Black Panthers manifesto. (Click here to view the text.) Huey P. Newton and Bobby Seale were the founders of the Party, and they wrote a manifesto that outlined the key points they felt needed to be addressed. 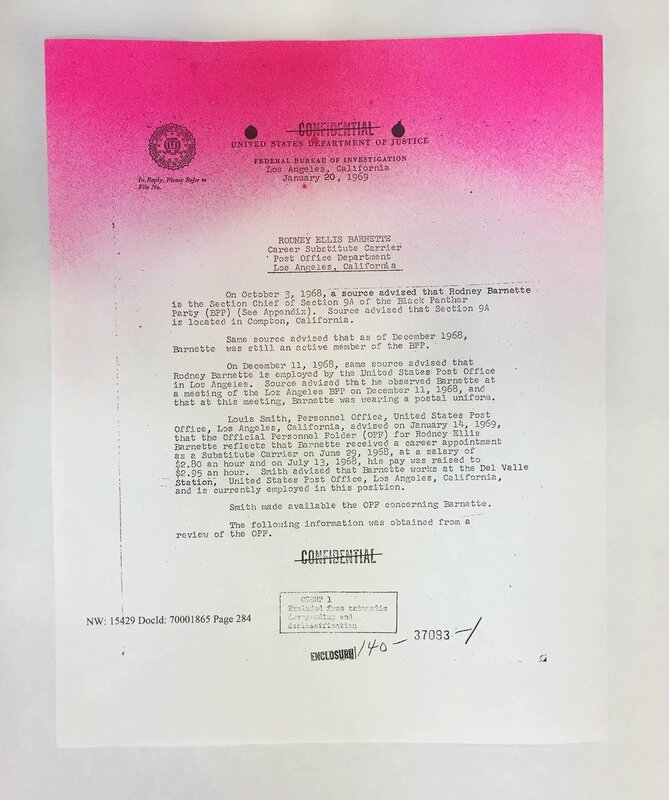 It was 1966, two years after the passage of the Civil Rights Act, and they're looking around the community and seeing that this effort on paper is not being lived in reality. People were still having tough times getting jobs. People were still suffering at the hands of the police. People were still living in subhuman conditions and having a tough time getting landlords to do anything about it. People were still not receiving fair trials. All of these elements that had supposedly culminated in the passage of the civil rights legislation were still problems. The founders wrote out the Ten-Point Platform to establish their reason for being, and the things they wanted to change. These points are listed on the exterior walls of this exhibition, and show that they are drawing up their rights as American citizens. That to me was always very powerful about where they started. They had a finite list of things that they said, "This is what we're committed to, and these are the actions that we believe will create these results." I've spent the last decade learning more about their history, precisely because they understood the opportunity of the American dream and recognized that it is their right as Americans to own that. They worked within the system. They were looking at the Constitution, they were looking at how to enfranchise these rights that people died for us to get. It’s important to me as somebody who has grown up mixed-race in America. My identity has been questioned for as long as I can remember. My mother who is an immigrant to this country never understood when I got upset that people asked me where I was from. She said, "Why does that bother you?" And I said, "Because I'm from here. I'm not from another country. I am from this country but no one seems to accept that.” That is part of my own personal legacy. 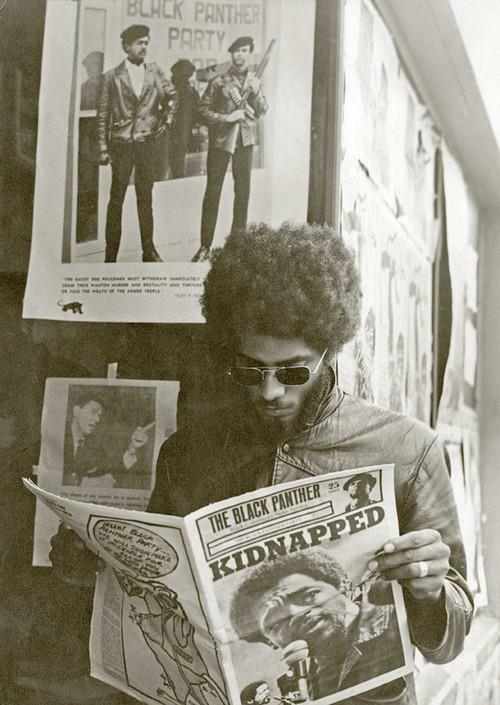 It certainly played into the resonance with which I took to the Black Panther Party, which was active for just over 15 years (1966–1982) That’s a relatively short period of time that has continued to, in false and true ways, in complicated and controversial ways, hold some part of the American identity. Paula: What do you think about the visual legacy of the Black Panther Party? How does that contribute to the public image of what they were? Michelle: Absolutely. There are at least two sides. There's the internal and the external. Within the Party, they were very aware of the power of the media. They had their own newspaper, which chapters were required to sell. That was one way that they raised money for themselves but it also put them in contact with the community. It was a way of sharing information. They understand the importance of media. They also understood the optics of newspaper, television, the burgeoning of media in the United States. It was not uncommon for them to hold a press conference or to notify reporters or TV crews when they staged actions. For example, when they went into the state capitol in Sacramento armed when the Mulford Act was being passed, they notified the media in advance, so there were reporters there. They understood the importance of that. They understood that even if they were being seen in a “negative” light, they were being seen. Remember that this was in the time of the Vietnam War, the first war that Americans were seeing on television. The Panthers were committed to the idea that if we're fighting and dying the public's going to see it. Emory Douglas, who has two pieces in the exhibition, is an absolute brilliant designer and illustrator. He was designated the Minister of Culture and was the art director for the newspaper. He was responsible for many of the illustrations that were in the newspaper that have become iconic imagery, such as illustrations of cops as rats and pigs. Paula: So part of this exhibition is material from the Black Panther movement itself. Michelle: There are artists included who were adults during that the time period, yes. Everything else is work from younger artists, many under the age of forty. They are all the legacy, but for the younger ones it was not a direct life experience. It might have been a family experience, or a media experience. They have all spoken to their connection in a variety of ways. Sadie Barnette’s father was the founder of the Compton chapter and he was constantly under FBI surveillance. Under the Freedom of Information Act, she obtained the 500-page file that the FBI kept on him and she has made work from it. This is a selection of that. Flag Baby is over on that far wall. Ouidakathryn Bryson served over twenty years in the Marine Corps. She is originally from Seattle, and now lives in Seattle again. She started studying photography when she retired from the military, and in 2014 completed her BFA at Seattle University . 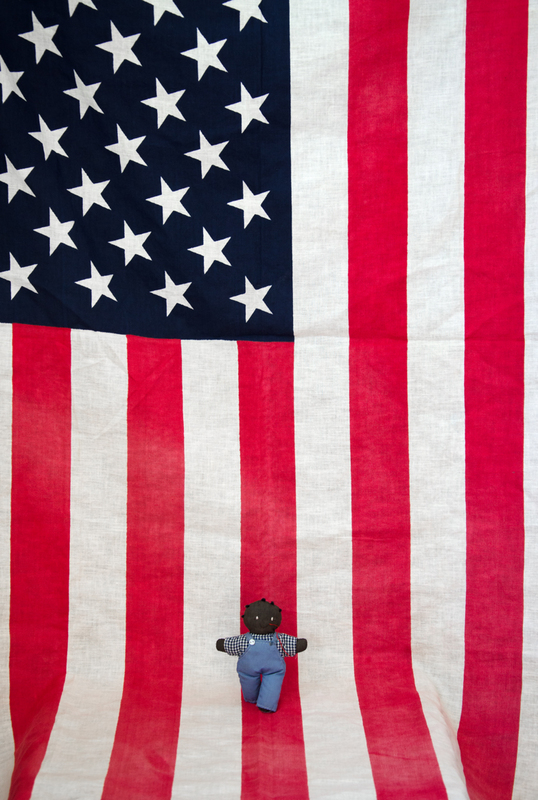 There was something so simple and yet so powerful to me about the US flag with this very simple handmade doll that had been passed down and looks loved and worn. And also looks very alone within the space of this flag. Paula: I was particularly moved by the four photographs by Kris Graves. Michelle: Those four pieces are from A Bleak Reality. Those are sites where he made photographs at the places and the time of day where African-American men were killed by the police. Police brutality is an ongoing issue, particularly for our young African-American men. Kris Graves, The murder of Philando Castile, Falcon Heights, MN, 2016; The murder of Michael Brown, Ferguson, MO, 2016 both from the series "A Bleak Reality"
Paula: I also love the photographs from the series Am I What You Are Looking For? Michelle: That is Endia Beal, a series that I saw for the first time in 2015 and that absolutely knocked me out. That series came out of her own experience. She did her undergraduate degree in North Carolina and then went to Yale. Even within the bastions of the liberal arts learning sometimes people ask you weird questions and want to touch your hair. She was in a place that you don’t expect to be like that, and then it was. The backdrop in each of those images is a photograph that she took of an office environment that she was working in. She brought it to the homes of these young women, asked them to present themselves as they would for a job interview, and then to talk about their experiences in corporate America. Many of these women were students of hers, so they're between 19 and 25 years old. She interviewed each of them to get a sense of "What has been your experience?" Or "What do you hope for?" "What are you looking for?" Many of them speak to a kind of alienation from how they present themselves and what they feel society is looking for, being incongruous with what corporate America seeks or deems appropriate. This relates to Point Two of the Ten-Point Platform that is addressing issues of full employment and economic advantage within communities. That's a tough thing to visualize, as she does it so well. That series is conveying that very direct and important point in 2016 and she expresses it in a specific and intelligent way in a strong visual manner. Paula: Why did you want to have this show presented here at AIPAD? Endia Beal, Sabrina and Katrina, 2015, from the series "Am I What You're Looking For?" Michelle: This is beyond my wildest dreams. I was excited when it was approved by the board as an exhibition in Seattle at the Photographic Center Northwest. Noting that the 50th anniversary of the Seattle chapter of the Black Panthers was forthcoming, I went to the board and suggested I could develop something Seattle-specific, or an exhibition from the book project—they agreed to the latter. The Frye Museum, where my co-editor Negarra Kudumu works, is doing public programming with some of the artists in the exhibition. It was a nice opportunity to work in partnership with another institution to bring some of the artists out to Seattle too. Last fall, I showed book to Steven Kasher who is an AIPAD member. He does a lot of work with photographers that are interested in social documentary work and the civil rights movement. He said, "This needs to be seen in New York." He brought it to the AIPAD selection committee and we were very fortunate that they chose us to be one of the three special exhibitions here. Paula: What kind of response have you gotten? Michelle: It's been really incredible to watch people interact with the work. For some people it's very unfamiliar, for some people it's very familiar. The photographic world is incredibly homogenous, but there is a championing of a wider diversity of artists right now. That's phenomenal. I'm very happy to see that and it's so important. I think we need to continue to champion inclusion and diversity on the “gatekeeper” side as well. In my professional life there’s a level of discomfort if I speak about my own experiences of being brown and white. There's not a lot of space for that. It makes people surprised, and then often uncomfortable. They don't want to hear about the times I've been asked to represent the Palestinian perspective or the Muslim perspective or let's just call it the “other” perspective—and then they often say ‘wow, I don’t see you as anything at all,” as if my passing as only Caucasian is some kind of compliment. Until we start some dialogues around that we aren't going to really be able to move forward. We have to be willing to be a little bit uncomfortable and that's hard to ask people to do. It’s a great privilege to curate a show or to edit a book. It’s a privilege that I occupy this space. And it’s also a responsibility. PCNW has made a commitment to visual literacy over the last year and a half that has been very important. I feel like through photographs you can teach people a lot. If you say we're going to talk about misogyny or racism, it can close people off. If we look at a photograph and talk about it in terms of “tell me what you see,” it fosters a dialogue where people begin to understand their own bias. We can talk about what is there in the photograph and what the viewer is bringing to the experience. That gives us an opportunity to talk about all sorts of issues through a different lens. It’s communication through photography. Click here for more information about the book "All Power: Visual Legacies of the Black Panther Party"
All images courtesy Photographic Center Northwest from the exhibition.